We cannot say we academics were not forewarned that the university was in danger of destroying itself: Allan Bloom sent out his famous clarion call to try to prevent the disaster confronting us now, over a quarter of a century ago! In his book, The Closing of the American Mind: How Higher Education has Failed Democracy and Impoverished the Souls of Today’s Students, he pointed out the paradox that although the university was created by philosophy, students had little exposure to it, nor did they have any idea how important philosophy was to the university’s existence. Most students knew that an expert, say, in mathematics, received a Ph.D. in that discipline and should be addressed as “Doctor So-and-So,” but they often did not realize that Ph.D. stood for “Doctor of Philosophy.” They certainly would not be able to answer the question of what philosophy had to do with math, history, English, science, anthropology and the rest of the academic subjects. Today, it is easily possible that even their teachers have no idea how to answer that question because the teachers attended universities which have since ignored Bloom’s admonition to pay attention to the fundamentals of what a university education is for: many teachers may have little idea how important philosophy is to the university. We will get back to the question of the purpose of a university education in Part Two, but let me begin with Bloom’s fundamental point by asking, What is philosophy? 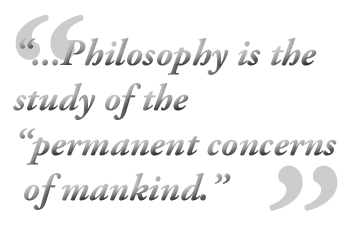 According to Bloom, philosophy is the study of the “permanent concerns of mankind” (Bloom, 1987, p. 19). As a very brief summary, the history of philosophy in the West began when Thales of Miletus, Greece, left us his cryptic summation, “All is water.” This may not seem an auspicious start to "the permanent concerns of mankind," nor to the vast array of fields available in a college catalogue, but Thales' method of thinking––his objectivity––was momentous. His idea was not contingent upon faith or superstition or politics, instead he saw life from an independent perspective. His method would eventually lead, for example, to physics, a discipline which, fantastically, ends up echoing Thales twenty-five centuries later concluding, "All is energy" (Redner, 1987, p. 301). To develop objectivity, philosophy students had always been required to ask themselves questions about their own opinions, prejudices, passions, and especially, their vanities. Moreover, as students advanced, philosophy encouraged them to think about the meaning of life, something that many students longed to do but had often never been given the opportunity to try (Bloom, p. 243-4). How did philosophy grow from the practice of developing an objective perspective and then reach all the way over to what seems an entirely subjective fulfillment of some inchoate longing for meaning? It would take an entire Introduction to Western Philosophy course to completely understand that journey; however, in brief, it achieved this feat by introducing those who had already gone on the adventure of the mind to those eager to begin. A relationship developed between the new seeker and the experienced pathfinder, a Platonic relationship whose first step was trust: if the beginners learned the discipline of objectivity by trusting the teacher that objectivity was an important discipline to develop, then they earned a high regard from their teacher (a teacher who knew how hard-won that perspective is to achieve him- or herself). We are not talking grades, we are talking authentic personal respect. Then the philosophy students began to feel a sense of competence, significance and meaning; and all-the-while enjoying the teacher’s warmth and companionship so necessary on a journey as dangerous––and at the same time as thrilling––as that required to take a hard look at one’s most deeply held prejudices, passions and vanities, seeking the truth whatever and wherever it may turn out to be. One such adventurer was indeed Plato, the Father of Western Philosophy who was the first to write down the word ‘philosophy’ in a story he wrote, The Symposium (~500BC), about his teacher, Socrates. In that story, each guest at a wine-drinking party (συμπόσιον (symposion) means “drinking party”) had to stand up and give a speech on the subject of love. When it was Socrates’ turn, he stood to present what his teacher, Diotima, taught him about becoming wise. She told him that just because it was difficult, maybe even impossible, for Socrates to be truly wise, it did not mean that Socrates should not try. She compared pursuing philosophy to that of loving a beautiful person with whom one never fully unites or understands: the attempt to achieve union and understanding is of value in itself. 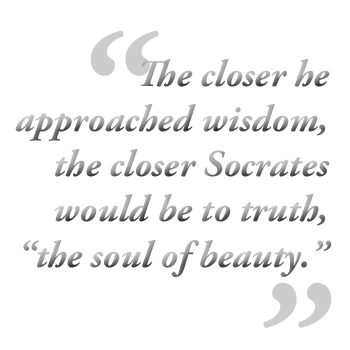 Diotima said Socrates should love (φίλος (philos)) wisdom (σοφός (sophos)) because the closer he approached wisdom, the closer he would be to truth, “the soul of beauty” (Symp. 211d). Therefore, the endeavor of loving wisdom (philosophy) would give him a “life worth living” (Symp. 211d). Moreover, those who thought they were already wise would never take a risk to pursue that which would risk changing their opinions, prejudices, vanities. Those who thought they were already wise would never begin the journey. They would remain stuck in their “wisdom” (sophistry). The love of wisdom began with the paradoxical position of knowing that one did not have a corner on the truth: one must search for it. Barring a self-generated humility, that of “knowing that one does not know,” required the development of a humility that is a great deal more painful to acquire than students at first can imagine. The teacher is there to give support during that painful discipline. So, teaching and philosophy have an importance in the university that goes beyond training or instruction, but has a motivational and relational component that is essential to helping students (a) realize they need an education; and (b) find their way out of the cave of ignorance. Meg is originally from Washington, D.C., and has lived all over North America and just recently returned from four years of living in The Hague, The Netherlands. She is married to Dr. Daniel R. Tufano, Sr., a scientist, and has two sons, Julian and Danny, Jr. She completed her undergraduate degree at The University of Toronto and her Master's at Antioch University, Midwest. (More about her education is in Part Three of this series.) Her favorite city (so far) is Florence, Italy, the background to her picture at left. She has just had her first novel published by SynaptIQ+ in their fiction imprint under her pen name, Meg McDermott. She loves new writers and encourages submissions on social era topics for The Journal; and is happy to discuss publication by authors of both fiction and non-fiction books.